Details: Weighs 380 lbs and holds up to 600 pounds (approximately 165 maximum weight per person). 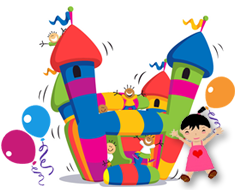 Requires electrical outlet, garden hose with active water supply (hose can be provided).Our Monster Wave inflatable water slide rental NJ includes safe climb up stairs, enclosed soft landing pad and TWO SLIDING AREAS! The slide simulates riding down rapids with a thrilling wavy bump between the journey down to a splash landing! Recommended by Fun New Jersey. Details: Our 22′ Roaring River 2 Lane Run ‘N’ Splash Rock Arches Combo features a radical sliding angle that’s sure to get the adrenaline pumping as riders scream down our 22′ water slide. At the bottom, riders continue down 35′ of additional sliding fun before exiting this mind blowing ride. This unit is perfect for schools, churches, summer camps and more. No mater the age everyone loves this ride! Requirements: Electrical outlet and garden hose with active water supply. Details: Our Run ‘N’ Slide Rock Arches 2 Lane Slide is 31′ of slppery fun. Custom Rock Fabric and beautiful blue slide cover material make it a customer favorite.